I know there’s an incomplete Calibre recipe on HaikuPorts (it’s a very complex application to port, I see), I hope that more can be done on that. Said that, I would like to donate two ebook readers I’ve hanging here to whom would take the task of completing the Calibre recipe and a reliable comm bus for connecting them on Haiku. I did not try it, but is working for Kindle? I am trying so hard to switch to Haiku for my alldays work… but… some things are missing. Nice idea. Both on Calibre and on donation possibility. 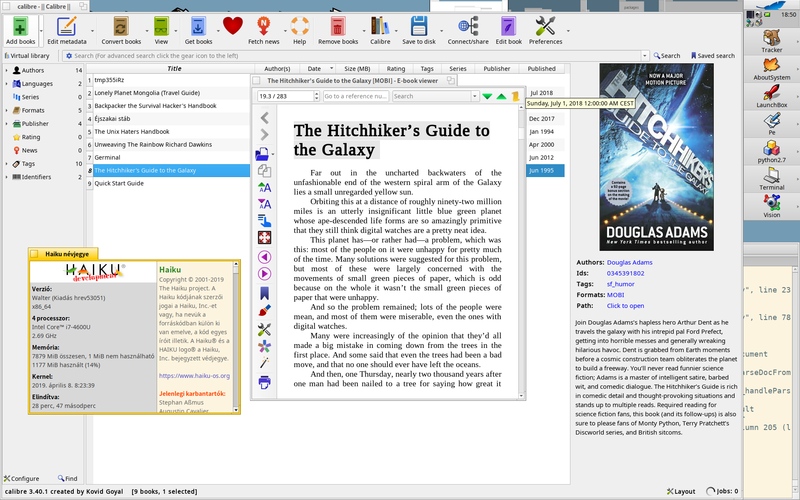 I think that it may depend on the Kindle version, but all the Kindle versions i had (i think that v2 to v6) can be used with Calibre, communicating ok in Windows, using the Mobi format. So you might still get usable software for your hardware. no atm. Calibre recipe builds but won’t run. Anyway, when the task will be done, it will probably works as it’s handled by Calibre itself. No, it isn’t complex, it just have plenty python dependencies, and i’m way too lazy to write proper recipes for them, as i already explained in an other thread. There is no need for donating readers, but one (more) have to sit down and do the boring recipes for python modules. They aren’t hard to create, almost all the python recipe looks like the same, so everybody can do them. Instead donating and waiting til lsomebody bites the bullet, just do the recipes for them. Just a small notes: calibre uses dbus to recognize the attached hw, so Calibre never recognized my reader (i’m not sure where it goes wrong, i assume it is dbus and/or libusb, this needs debugging). But library-operation, metadata-editing, reading and conversion working nicely (at least worked at that time). My patches upstreamed for Calibre, Kovid Goyal merged them, but it aged a bit, so it needs some patching here and there, but nothing impossible. So if you got time, write recipes for the required missing python modules. For inspiration HaikuPorts already have plenty, you can study them. I’m conflicted. I use Calibre ever once in a while under Linux, and I do like having it on Haiku, so it’s one less reason to boot another OS. OTOH I think Calibre is a horrible, horrible app to use. It have way too much features, wich i disable, so the whole GUI is just the Library-list, no icons, no other panels. I don’t like it either, but works and works well, i think i use only 10% of the features, i drop the file on the window, it gets added to the library and i send it to the device, and if it needed Calibre automatically converts it to a usable format. That’s all, i don’t add covers, doesn’t change the metadata, don’t use Calibre as reader, just autoconvert and push to device. I can imagine a small native program with only theese features. I think it is possible to take the converter engine as-is, and weld a Haiku GUI around it. It is just a bunch of python scripts, nothing else. For auto-convert the device-recognition code needs to be liberalized too. Calibre can run in headless mode (or is it the server part)? But as they using PyQt for GUI it should be possible to tap on that interface. devices recognition not working yet, possibly dbus related, i think. viewer, converter, import, meta editor, etc, so the library functionality works ok.
generic application icon and “Python” shows up in the deskbar instead of Calibre icon and name. I am pretty bad with Python and can’t seem to find the reason. So if you want to see Calibre on Haiku and have Python experiences, now THIS is the time to help. This is one case where i found the original GUI version “better” than the Haiku styled one. I know it follows the guidelines but… hummmmm. One can make nicer icons, I just recoloured one, but I have no artistic veins. Nice! Will grab, but python or deskbar have to be extended to support it. Wow…what a pity I wasn’t around in the Haiku community at the time of the iconset contest. I would have vote for yours. Honestly!